Frozen green soybeans, often served in Japanese restaurants as an appetizer, are called edamame. Shelled edamame are soybeans that have been removed from their pods. A 1/2 cup serving of edamame has 120 calories, 5 grams of fat, 5 grams of fiber and 10 grams of protein, making it an ideal vegetarian protein selection for a low-calorie, heart-healthy diet. 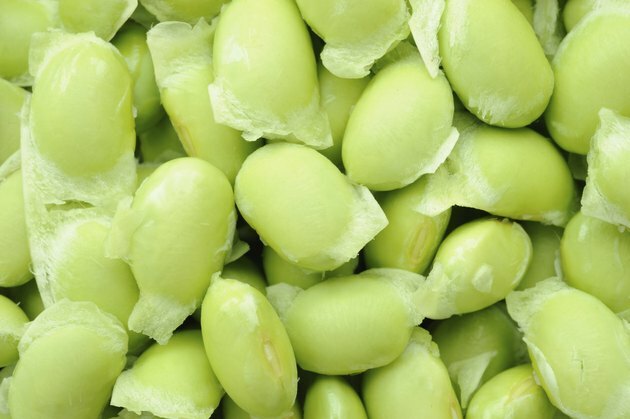 When you buy edamame frozen, you can heat up only as much as you want while preserving the rest. Sprinkle cooked edamame with coarse sea salt and serve it plain or sprinkle the beans over a green salad. Boil 3 cups of water in a medium saucepan. Add 1/2 pound shelled edamame and 1/2 teaspoon salt to the boiling water. Boil the soybeans for five minutes. Drain the soybeans through a colander. Rinse the beans with cold running water before serving. Place the desired portion of edamame in a microwave-safe dish. Microwave on high for two to three minutes. Take the dish out of the microwave and allow it to stand, covered, for one minute. Remove the plastic wrap and serve.